From 16th-century origins as a trading venture to the East Indies, through to its rise as the world’s most powerful company and de facto ruler of India, to its demise amid allegations of greed and corruption, the East India Company was an extraordinary force in global history for three centuries. 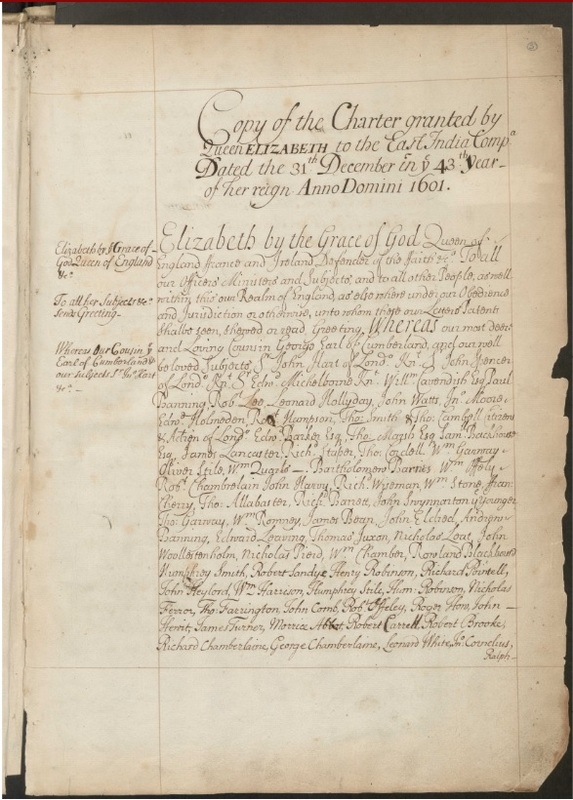 Copy Letters Patent of Elizabeth I granting to the Earl of Cumberland and 215 others the power to form a corporate body to be called the “Governor and Company of Merchants of London, trading into the East Indies” and naming Thomas Smith the first governor. : Available through: Adam Matthew, Marlborough, East India Company, http://www.eastindiacompany.amdigital.co.uk/Documents/Details/BL_IOR_A_1_2 [Accessed March 09, 2017]. From the Company’s charter in 1600 to Indian independence in 1947, the East India Company resource tells the story of trade with the East, politics, and the rise and fall of the British Empire. It records the challenges of a globalising world and sheds light on many contrasting lives – from those of powerful political figures to ordinary people in Britain and Asia and the individual traders who lived and worked at the edge of Empire. This entry was posted in Library, Online resource, Trial and tagged Britain, Databases, History, India, International Relations, Letters, Manuscripts, Politics, primary source by cstirling. Bookmark the permalink.